TPC’s youth group gathered for a lock-in focused on service and mission on Friday, March 16. Early in January, the youth group began talking about the lock-in and ways we could give back to our community. We decided to do something in our community that involved hunger and chose World Vision’s 30 Hour Famine program. 30 Hour Famine is an amazing program centered on hunger issues. The program comes with source materials, videos, study guides and activities. As part of the program, we fasted from about noon on Friday until about 6 p.m. on Saturday. During this time, we studied hunger and talked about how we as Christians are called to serve those in need. I am so proud of all who participated for their level of commitment and willingness to have open and honest conversations. One in nine people in the world does not have enough to eat. Every five seconds a child under five dies; nearly half of those deaths are from hunger-related issues. 2.5 million babies worldwide die within the first three months of life from lack of postnatal care. One in 10 people worldwide lives on less than $1.90/per day (that’s 736 million people). In addition to learning about hunger, we played a traditional Congolese game, which is played by jumping and kicking with your feet. The object is to score points by kicking with the opposite foot as your opponent and kind of looks like you are dancing together. It’s fun but when you’re hungry turns don’t last long. 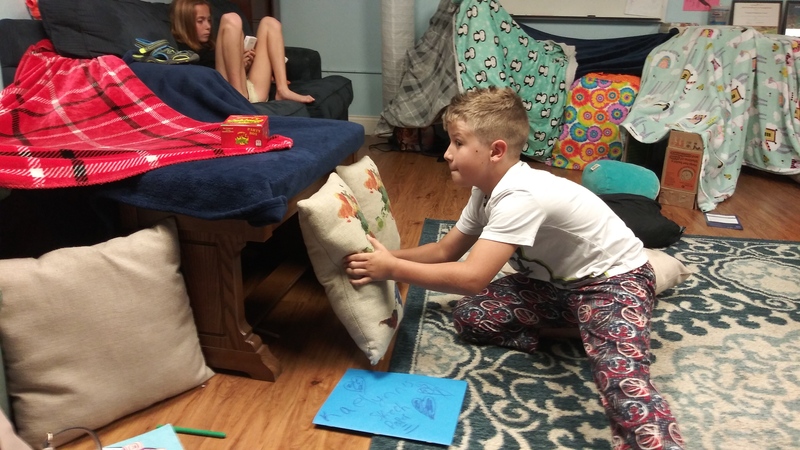 Later in the night, we had a fort-building challenge. Students were given several empty cardboard boxes and told they could use anything in the youth room to build a shelter. The room immediately erupted in activity. 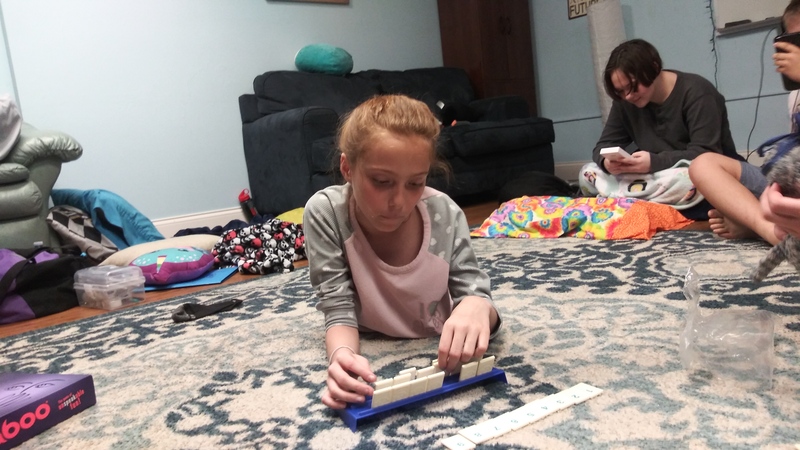 In the beginning, the group was going to build one structure together but quickly got so excited and busy building they ended up with six structures. I was so impressed! Each of the forts had elaborate layouts with doors and windows. A couple even had secret peepholes. 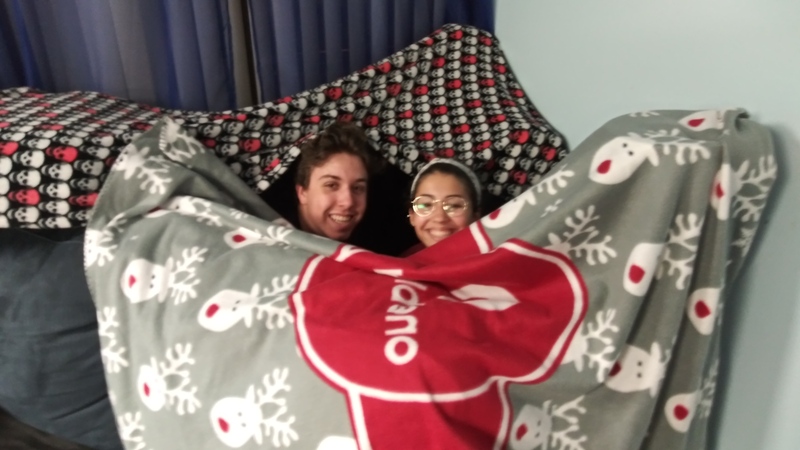 They built a tent city with blanket roofs and couch cushion walls. I think they would have slept in their creations had we let them. During our study, we met Maria, who is from the Congo and is 14 years old. Her mother became very ill and was hospitalized for a long time. As a result of her mother’s illness, Maria had to quit school so she could take care of her brothers and sisters. We learned Maria had to spend countless hours collecting and cleaning palm nuts for pennies just to help put food on her family’s table. We were told Maria’s family of about ten lives on less than $2 of food a day. We watched her and her siblings pick potato leaves from their front yard and boil them for their daily meal. We saw Maria walk for miles to carry water to her home—water not fit to drink before boiling. The youth really connected with Maria and felt the injustice of her circumstance. #HashtagLunchbag is another great organization. 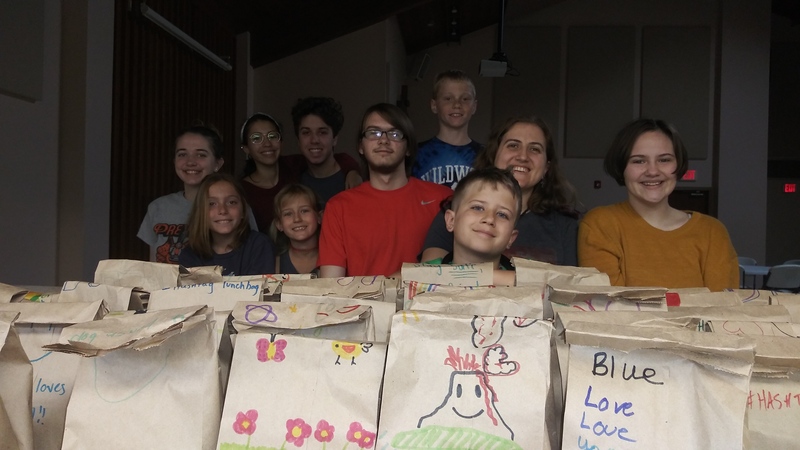 The ministry is simple: a group meets, makes low-cost lunches in brown bags, the brown bags are decorated with inspirational messages and the lunches are distributed to those in need. The ministry began on Christmas Day in 2012 in Los Angeles when a group of friends was looking for a quick and easy but meaningful way to give back to their community. 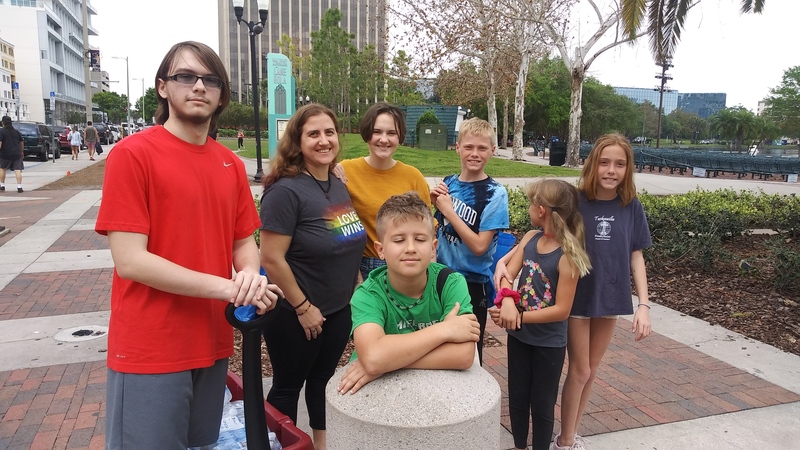 In fact, the group didn’t intend for it to be a lasting ministry but, as the story was told and retold, more and more people wanted to get involved. Since 2012, #HashtagLunchbag has provided meals at least once a month in 100+ cities all over the U.S. and in eight countries around the world. The ministry is cost-effective; corporate overhead is almost nothing and it’s fun. Our group made about 54 lunches for just under $80. It took us less than an hour to assemble the lunches and they were gone faster than anticipated. #HashtagLunchbag encourages groups to make and distribute 100 lunches but we decided to cut back because we had a small group. Call it a happy accident: 54 lunches for just under $80 is less than $2 a meal and is about what Maria feeds her whole family for a day on. This made quite an impression on the youth. We talked about this with the aroma of peanut butter in the air and pains of hunger in our stomachs. After cleaning up we set out to Lake Eola to pass out our lunches. I can report after close to 24 hours of fasting, peanut butter smells amazing and you can still smell it even after it is put into a Ziploc bag. As we neared Lake Eola, some of our younger youth began to ask questions like, “How will we know who needs food? How will we know who is homeless?” Christina and I took a quick moment to explain that we wouldn’t always know but people would know why we were there. We reminded them to smile and look people in the eye, that today was about dignity and they were to focus on feeding people who were hungry not on how they looked. Once we were on the path around the lake, the group took to their task like they had been doing it all their lives. With a sense of how important the mission was and a genuine desire to help, our youth covered the area like a well-trained NATO squad minus the rifles and varied accents. Unfortunately, we each learned a hard lesson. There were more hungry people than we had food for. I saw a real sense of sadness and mature compassion in the eyes of our young people. 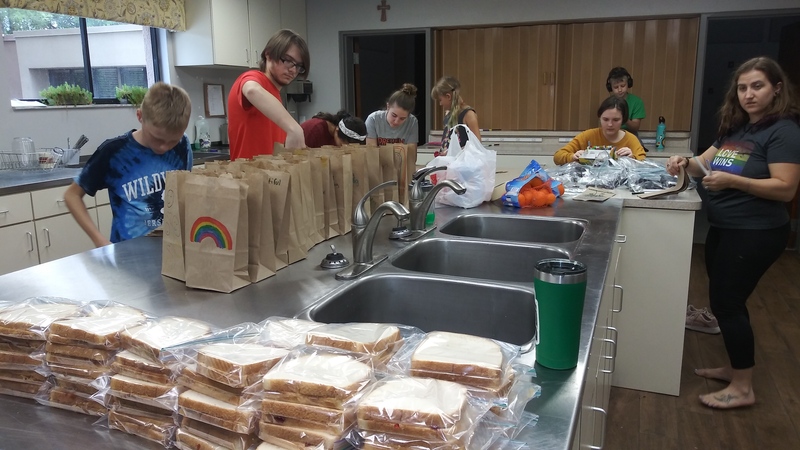 As I felt like weeping, one of them said, “Next time we need to make all 100 lunches!” With a tear in my eye, I promised we would never cut back again and reminded them even though we couldn’t help everyone it meant a lot to those we did help. We had a great time together and learned a lot. 30 hours is just long enough to really know what hungry feels like: headaches, low energy, grumpiness and no motivation—all things we didn’t realize went along with hunger. One of our younger youth connected the fact that we did this for 30 hours and there are people right here in Orlando that feel this way all of their lives. We learned chicken stock, affectionately called chicken juice by our youth, tastes pretty good when you are hungry even if it is room temperature. Christina and I are so proud to be part of such an amazing group of young people. The love and commitment shown by them is incredible. It’s one thing to feed someone who is hungry but to be hungry and feed someone who is hungry is a deeper experience—an experience that brings compassion and understanding. We would love to get more involved with #HashtagLunchbag and invite our church family to help. More on that in the future. For now, I encourage you to check out both organizations on the web.